Teasers or reminders: that's what these wrap-ups of "Catch of the Day" are meant to be. Not "reviews." But because the programs, though captured on audio, have yet to be posted, the comments have been running longer than intended. Now that I've come clean, let me try to reform. 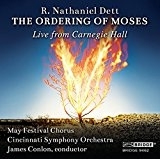 On February 5, we opened with the Biblical oratorio The Ordering of Moses (on the Bridge label), by the black composer R. Nathaniel Dett (1882-1943), recorded live at Carnegie Hall by the May Festival Chorus and the Cincinnati Symphony Orchestra under James Conlon. In the sequence we listened to, Dett's mastery of orchestral writing and imaginative integration of spirituals made a fine showing. The march of the Israelites dragged on too long, perhaps, but the instrumental depicting the drowning of Pharaoh's army flew by in vivid colors. Okay, we're not on the Handelian heights of Israel in Egypt, but it counts when a project arises from the history and traditions of its performers and audience. 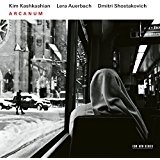 The album Arcanum (ECM New Series) presents the A-list violist Kim Kashkashian in recital with the composer-pianist Lera Auerbach. Their program couples the title piece, by Auerbach, with Auerbach's transcription of Dmitri Shostakovich's seldom-heard 24 Preludes, op. 34, originally for piano. In Adempte (possible translation: "You who have been taken away"), the fourth and final movement of Arcanum ("Secret" or "Mystery"), and in the first four Shostakovich preludes, the musicianship was crystal-cut, the textures ever-shifting, consistently fascinating. The viola part in the Shostakovich is so convincing on its own terms that one wonders how it could derive from pieces for a keyboard. Highly recommended. 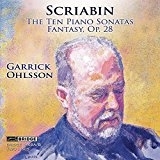 From Garrick Ohlsson's two-disc survey Scriabin, The Ten Piano Sonatas (on Bridge), we took in the Sonata for Piano No, 9, op. 68, the so-called "Black Mass." Why the title? Who knows? In candor, neither the architecture of the piece nor its ideas, and there always ideas in Scriabin, came through to me. But then, that is often true with Scriabin. Still, one keeps trying. It's also true that under Scriabin champions like Riccardo Muti or Valery Gergiev, the symphonic blockbusters never fail to thrill me. I could find no fault with Ohlsson's interpretations but no pleasure either. 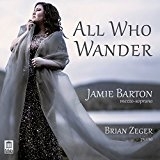 To close, we sampled All Who Wander (Delos), the debut album of Jamie Barton, mezzo-soprano, with Brian Zeger at the piano. A blurb by Joyce DiDonato, herself a reigning mezzo-soprano, promises marvels, and Barton delivers rapturous tone and radiant expression. From a program also including Dvorak and Sibelius, we selected three songs of Gustav Mahler. I was especially curious about "Ich ging mit Lust," a song I first heard when Jessye Norman sang it to me a cappella during an interview in the park of her palace hotel outside Salzburg years ago. Its wide-arching phrases evoke a forest resonant with birdsong: what magic to hear those phrases with live birdsong in the air! No one will erase that memory, but Barton complemented it (as did Zeger, with his silken touch). For encores we had more Mahler: "Blicke mir nicht in die Lieder," abuzz with the sound of bees at work in the hive, and "Ich bin der Welt abhanden gekommen," the valedictory to end all valedictories, delivered with preternatural equanimity, as if for the first time and the last.